Like 99 per cent of the world’s population, Marc Methot went into last night’s game against the Penguins with a full set of 10 fingers. Minutes later and he was off the rink with nine and a half left. What had happened was pretty gruesome, and though I’m proud to say that NOPE videos tend to be my forte – this one did make me quiver. So with no more wasted words let’s get to the gory details. 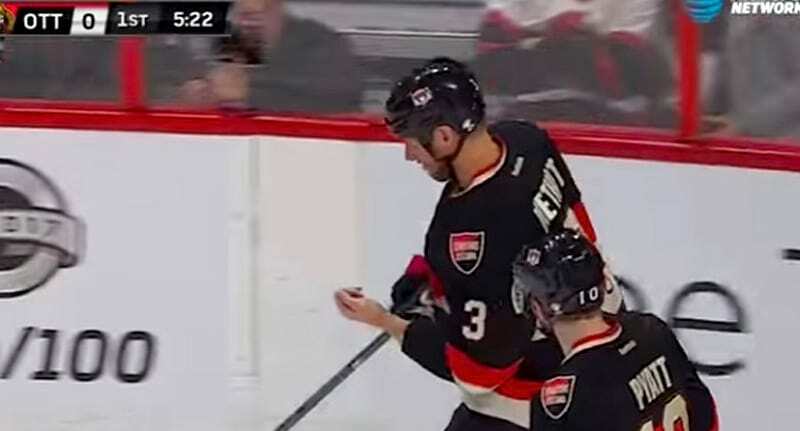 Early in the first period of the Thursday night NHL bout between the Ottawa Senators and the Pittsburgh Penguins, Methot was charging down the rink towards the Penguins’ goal. As Methot drifted ever deeper into the opposition’s half, Penguins captain Sidney Crosby looked at him and thought ‘not today’. With that in mind, Crosby slashed his stick down towards Methot but missed both the puck and Methot’s stick. However that isn’t to say he missed entirely. No, Crosby slashed his stick hard into Methot’s little finger, and sickeningly, he almost separated the tip of it from his hand entirely. His finger is destroyed. It’s shattered and he’s out for weeks. Amazingly – despite his finger being ‘destroyed’, no penalty or foul was awarded. But I guess that’s just the nature of the game. If it’s any consolation to Methot his team did win 2-1 so it’s not all bad.